There are some opportunities that come along in life that has one pondering what to do with the choices laid out in front of you. Recently, I was faced with one of those tough situations. I am very fortunate, through my business, to have become friendly with people all over the world. In the past few years I have watched RC Boating in the Middle East, especially in Kuwait, become very popular—orders from Kuwait and other states in the region have become more common. 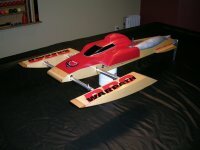 I thought, like most everybody does, about how they can race RC boats in the sand and weren’t there more problems to contend with than worrying about this hobby? Boy, was I wrong! The notion of problems and lack of water is far from the truth. After the first few conversations with some customers in that region made me realize they love this hobby as much as we do here in the States. Just like most of us they have the insatiable craving for any and all RC boating information. Thanks to the many conversations and trading video clips, it was easy for me to see these guys have come a long a way in a short-time and have definitely figured out what this hobby is all about. Then it happened, that opportunity was thrust in my lap during one of my weekly conversations with Louay Bahman of Kuwait. He was placing an order and asked about some of the new CC Racing parts we had coming out. After a few minutes, he asked me if I would be interested in traveling to Kuwait for vacation and spend time helping setup boats while visiting. In addition to the boat setup sessions, he asked if I could attend a race and help discuss rules and race procedures with officials as they wanted to advance their programs to the next level. To say I was taken back was an understatement. After all, it wasn’t like this was a quick trip to Florida. It was a big journey to a country I knew little about other than what I had seen on the local evening news. I asked Louay to give me some to think about it. Later that day, another call came through from Kuwait. This time it was my buddy Khaled A. Al-Hashel and he was quick to put the pressure on me. “Boss, you have to come. You will love it. It will be just like vacation and we will take care of you,” he stated. I have to be honest, at this point I was a little nervous—I am an Italian guy from southern Louisiana and the only picture I had in my head was the stereotypical view from the nightly news. A few more conversations with a lot more questions with Khaled eased my views and he continually assured me of his country’s beauty and its likeness to the United States. My wife was the final push I needed to commit to the trip. She is very good at persuading me without actually hitting me in the head with something. And she was right, it was a great opportunity to promote the hobby I love and spend some quality time with great friends in a far away region of the world. And just like that, a couple of hobbyists from the US were going to be making their way to Kuwait for an adventure in boating and fun. Well this trip starts on the Monday morning before Mardi Gras in New Orleans and only a couple weeks after the Saints have won the Superbowl for the very first time in their forty three year history. What that means for the people that don’t know much about New Orleans is that there will be an enormous amount of nonstop partying and Mardi Gras parades from sun up to Sun Down in New Orleans and most importantly that there are no flights at all to be had for Brent to fly into New Orleans so that we can fly out to Kuwait together. So after endless searching for airfare that would work we finally decided that the only choice we had was for me to fly to Vegas and then from Vegas to London and from London to Kuwait. I have to let you know that Brent really owes me a big one for this and has teased me on more than one occasion that I got hosed on that part of the deal. Well I got on the plane on Monday morning and flew from New Orleans to Dallas, from Dallas to Oklahoma, from Oklahoma to Las Vegas on the same plane without getting off (Remember we did not have much of a choice). Six hours later I was on the ground in Vegas walking through McCarran International Airport to meet up with Brent—who was driving there from Lake Havasu. He was running a little late as he had made a wrong turn and ended up on the Strip in Las Vegas while trying to find the parking lot. He finally made it in and when he did he was about 5 minutes too late to walk straight up to the ticket counter as there was three Rugby teams that showed up minutes before him and they completely filled the roped off lines for check in. You know that I had to have a couple of laughs at his expense; I thought it was only fair for the six hour ride to Vegas I had to make for him. Well I let him stand in that line for about twenty minutes or so before I decided I would let him know about the kiosk that he could check in at with no wait. After check in we boarded a very big British Airways Boeing 777 that would take us on a ten hour trip to London’s Heathrow Airport. The Boeing 777 is one of the nicest birds in the sky. Our flight consisted of some food, a few movies, and an attempt at getting some sleep. We arrived in London—very tired—to a typical British day of rain, fog, and 39 degree weather. The seven hour layover started with us freshening up as best as we could in the airport bathroom and then grab some food from the Wagamama Asian restaurant. After getting our fill of Asian cuisine, we wondered the massive airport, which includes a shopping Mall, took pictures by the Lamborghini and Audi that were being raffled off and Before we knew it, Brent and I were waiting to board another Boeing 777 for our final leg to Kuwait. A short taxi on the runway and the jet lifted off for a destination in the Middle East—we wondered what people were thinking about a couple of American guys making this trip just to play with R/C boats. Then reality set in, the onboard map showed the route map and we were flying over Baghdad, Iraq. That map made us sit up and realize were we really were. Upon arrival, we were met by our friend Khaled—in his police uniform. Thankfully, he had already prepared our Visas and expedited our trip out of the airport. After a few moments one could see that Khaled was more than just a regular police office. The other officers called him Major and jumped to help and assist all of us at his command. As soon as we walked around the airport to get our bags it was already starting to show from all of the friendly people that things are nothing like what we had instilled in our heads about this country. When we got outside it was a bright sunny early Wednesday morning at 6:30am and it was a really comfortable 74 degrees. Khaled took us on the scenic route around the city to our Hotel and the things we got to see where just amazing. Kuwait is just simply beautiful. We drove past the Presidents Palace and were told stories about how the President had a good holiday season and paid the entire country money if you were a citizen. If you are a single man and you decide to get married and start a family the government gives you $10,000 to help you get started. If you want to purchase or build a house the government will pay for it and you will be charged $300 a month with no interest until you pay it off. All health care is paid for by the government and is no charge for Kuwaiti citizens. We were awestruck with all of these stories and how good the quality of life was in Kuwait. While driving along we noticed that there was all of the big chain restaurants that are in the states: McDonalds, Burger King, Pizza Hut, TGI Fridays, Hardees, KFC, Popeyes, Hard Rock Cafe, Starbucks and Baskin and Robbins are just some of the places that come to mind. We got to the hotel and were greeted by more very friendly people who assisted in us in getting our room situated. The view from our room was simply amazing as we overlooked the Persian Gulf and even the pond where we were going to run boats. We took some quick showers in the room and then ate at the breakfast buffet in our beautiful hotel. It was at that point and time that I think that the lack of sleep and traveling for almost two straight days finally started catching up to us. We decided it was still too early to go to sleep and that we guys we would be hanging out with during our stay. Khaled took us to James Lakens house to see one of the workshops where the Kuwait-based CC Racing team prepares their boats. James is a British guy living in Kuwait and loving it. Little did we know at the time of meeting him that James would become the entertainment for the trip. He is a RC nut and flies planes, races buggies and truggies, and now races RC boats and it showed as soon as we walked into his basement. There were airplanes everywhere, 1/8 scale Buggies, Truggies, quite a few boats and even some wood whiplash kits on the setup table being finished. James is quite the charismatic character and the British accent and banter had us laughing the entire trip. You could tell in no time that James was the humor among the group and he is quiet the storyteller. After a very short time Louay showed up and the laughter started again with all of the racing stories being told. We talked about RC Planes, Cars, Boats, props and engines for a couple of hours. We quickly realized that these guys were just like us and the only difference is that they live in a different country. There was a statement that Khaled made while driving that will stick in my mind for quite a long time “if Kuwait was located next to Texas then more people would love it. We are stuck where we are and have to make the best of our location. We have Iraq on one side and Iran on the other and we would love to just be the 51st state.” That made a lot of sense and kind of put things into perspective. The guys took us to eat some lunch at a Marina that had a few restaurants and we all decided on TGIF (Fridays). We had a good lunch while everyone was getting to know each other a little better in person. We did our best to stay up as long as we could and knew it would be in our best interest not to go to sleep too early but, we finally could not take it anymore and decided it was time to get to the hotel and get some sleep. On the way Khaled asked if we would like to see the lake as it was on the way, we agreed and were pleasantly surprised at how nice it actually was. The lake is located inside of a local park that has an amusement park type of feel there are bicycle and paddleboats that can be rented along with swings and all other sorts of things to do. The salt water is a beautiful crystal bluish green and is just calling your name as you look at it. The lake is fed from the Persian Gulf with openings at each side and the tide changes quickly with Gulf waters feeding in and out. There was a driving stand setup on the beach and they had buoys in place in the water. I asked Khaled where were the two buoys that were missing and he said they were taken out during practice. We had a quick laugh about the buoys and off to the Hotel we went. ...Continue to Part 2...Click HERE. Great Article. Almost like being there. Nice work Carlo. It is a good read, I am looking forward to the next instalment. Carlo, this is a really great article. I am really looking forward to reading the rest of it as it comes out. Glad that you and Brent had such a good time over there. Looks good so far mate my wife was really getting into it before we got to PART 2 coming soon. Great article! Thanks to Carlo for sharing it with us!